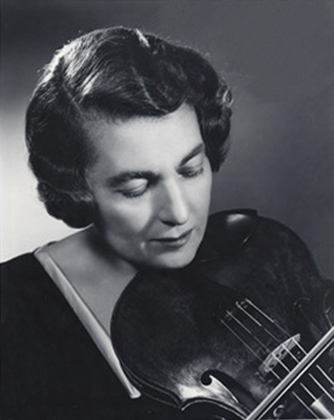 Lillian Fuchs, American violist, composer and teacher, studied the violin with Louis Svecenski and Franz Kneisel, and composition with Percy Goetschius, at the New York Institute for Musical Art, winning several awards at graduation. Her New York début in 1926 was as a violinist, but she began to make the viola her principal instrument soon afterwards and was a member of the Pérolé String Quartet from 1925 to the mid-1940s. As well as appearing in chamber concerts with her brothers Joseph (violin) and Harry (cello), she toured extensively as a violist in America and Europe, and played at the 1953 Casals Festival at Prades. Several viola works were written for her, including a Sonata (1955) by Jacques de Menasce; Martinu's Madrigals (1947) for violin and viola and the Sonata (1956) for viola and piano; Quincy Porter's Duo for viola and harp (1957) and Duo for violin and viola (1962); and Rieti's Triple Concerto (1973) for violin, viola, piano and orchestra. She played a viola by Gasparo da Salò, handling it with ease in spite of her small stature, and with flawless technique, obtaining a rich and expressive tone. Her interpretations revealed a most creative and sensitive musical mind. She taught at the Manhattan School of Musicfrom 1962, the Aspen Music School, Colorado from 1964, and the Juilliard School from 1971. Her own published works for solo viola include Twelve Caprices (1950), Sonata Pastorale (1956), Sixteen Fantasy Etudes (1961) and Fifteen Characteristic Studies (1965), also a Jota and Caprice fantastique for violin and piano. She arranged Mozart's Violin Concerto in G (K. 216) for viola and provided it with cadenzas (1947), and she was the first to record Bach's six cello suites on the viola. With her brother Joseph she made outstanding recordings of Mozart's Sinfonia concertante (K.364) and Duos for violin and viola (K.423 and 424).